What is the secret to helping your pup be healthy and content? There is one thing both owners and vets will instantly agree on. Proper nutrition is the first and the most important step towards your canine’s overall wellbeing. Your pup’s diet should be tailored to meet all the daily needs efficiently. These vary depending on your canine ’s life stage, breed, level of activity and possible health problems. An ideal food blend will have an optimal balance of essential nutrients, such as protein, carbs, fats, vitamins, and minerals. Finding the best dog food that will tick all the boxes for your pup is definitely a challenging task. Still, when there’s a will, there’s a way! The word powerful is probably the best description for this sophisticated food formula. Its number one ingredient, buffalo meat, indicates its abundant contents of real meat protein, vital for the proper development. Supported by peas and sweet potato, it ensures adequate levels of energy, that will keep your pup active and lively. A wide array of fruits and veggies supply high levels of antioxidants. Taste of the Wild will result in a strong, lean body of your canine. It will be easily digestible, owing it to its probiotic formula. Antioxidants contained in this blend will support efficient metabolic processes and elimination of toxins. Omega fatty acids will help to maintain the healthy look of your pup’s coat and skin. Knowledge and attention invested in the making of this blend are bound to reflect on your furry friend’s general well-being and contentment. This outstanding blend caters to the needs of the most sensitive ones in the canine world. Your growing puppy will enjoy the appetizing taste of this quality, nutrient-rich blend. DHA, a type of essential omega 3 fatty acid, sustains proper development of the brain and sharp vision in your baby pup. High levels of protein obtained from chicken and whitefish meal guarantee steady growth and plenty of energy for your playful little buddies. Your puppy will not have difficulties digesting this food, due to its contents of easily-digestible fruits and vegetables. These include cranberries, blueberries, and spinach. The right proportion of omega 6 and 3 fatty acids provides a strong basis for healthy skin and glossy coat. Its optimal balance of vitamins and minerals is important for proper growth and quality of teeth and bones. The best solutions are often the simplest ones! CANIDAE Grain – Free is certainly a proof for this statement. It combines only 9 carefully selected ingredients, to achieve the maximum of nutritive value. It will benefit senior dogs in particular, with its easily – digestible formula and lack of potential allergens. The protein in this savory mix comes from real chicken, as well as from chicken and turkey meal. They ensure sufficient levels of this vital nutrient to maintain the strength of the body and provide energy. The creators of this excellent formula aimed to achieve easy digestibility, by including whole ingredients. The possible incidence of allergies and intolerances is minimized by excluding the most common allergens. It never contains soy, corn, wheat, grains, and gluten. It is also hormone-free. Carefully balanced levels of minerals and probiotics help your pup’s metabolic and defense systems. The contents of this recognizable can will become your canine’s favorite craving in no time. With Blue Buffalo Homestyle, your pup is bound to feel the benefits of top-quality wet food formula. Its flawless balance of protein and carbs provide all that it takes for your pup’s active day. This delicious formula uses blueberries and cranberries as irreplaceable sources of precious antioxidants. Real chicken meat ensures the presence of essential amino acids, needed for a strong and vital body. Biotin maintains the health of skin and coat. It includes whole grains rich in fiber, to make digestion effortless. High levels of antioxidants sustain elimination of harmful toxins. They also take care of your canine’s urinary tract. Sensitive tummies and allergy-prone pups will find this formula suitable, as it rules out all the potential triggers of allergies and intolerances. The abundance of protein and plenty of antioxidants obtained from fruit is what makes this dry formula recognizable. It advocates the type of nutrition similar to that available in the wilderness. The creators of this blend believe in the powerful impact of protein, and minerals on the general well being and contentment of your canine. Chicken tops the list of favorite sources of protein in canine formulas. It promotes the healthy development of lean muscle, and fuel the necessary energy needed daily. Optimal levels of essential omega fatty acids keep your puppy’s skin healthy and result in a soft, glossy coat. Blue Buffalo Wilderness incorporates the mighty BLUE LifeSource Bits. This accurately balanced complex of vitamins and antioxidants help to build up a strong and efficient immune system. Calcium, phosphorous and glucosamine maintain the proper functioning of joints. Poultry makes the major source of protein in this nutrient-rich formula. Adult dogs eating this food on a regular basis will feel all the advantages of this high-quality blend. It addresses all the aspects of your canine’s wellbeing. Suitable levels of omega fatty acids, minerals, vitamins, antioxidants and probiotics set the right balance of these vital components. High levels of protein support strong muscle and body development. In order to keep the health and mobility of joints, it supplies adequate levels of glucosamine and chondroitin. Flaxseed and salmon oil serve as substantial sources of omega fatty acids, responsible for healthy skin and coat quality. 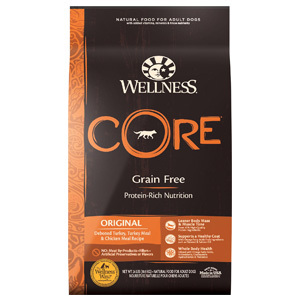 The kibble of Wellness Core features a special probiotic coating, contributing to easy digestion. The rich nutritive value of this mixture revolves around healthy veggies, including spinach and broccoli. It is suitable for allergy-prone pups. A quick look at the list of ingredients reveals the high quality of this raw blend. It is based on the principle of natural feeding tendencies of dogs and chooses the purest ingredients from nature. Chicken serves as a single source of protein, including organs and bone. Certified organic ingredients contribute their valuable nutrients. The manufacturers of this blend insist on cage-free chicken and organic fruits and vegetables as the main components. Its freeze-dried preparation brings about a number of benefits. It is always served raw, with the possible addition of water before serving these patties, although it is not obligatory. Insistent on natural qualities, this blend never includes artificial ingredients or chemicals. It is free of gluten, grains, food preservatives, as well as artificial flavors and colors. Its probiotic formula eases the digestion. The taste of venison in this savory formula will wake your furry friend’s taste buds up. In combination with sweet potatoes, it will create a nutrient-rich blend abundant in protein with a limited level of quality carbs. A small number of ingredients is aimed at creating a hypoallergenic formula, safe for canines with gentle tummies and oversensitivity. Natural Balance will provide all the necessary nutrients that will keep your pup going. Its high nutrient value will support your pup’s overall health. Optimal levels of omega fatty acids will support the healthy coat and skin in your furry friend. The manufacturers of this blend created a food product aimed at dogs prone to allergies and food sensitivities. In order to minimize the occurrence of these, it excludes all the potential allergens. It contains no artificial flavors or colors. Wellness Complete Health takes care of your pup’s overall health, by providing an excellent combination of animal protein and whole grains. It supplies optimal levels of nutrients and promotes easy digestion. This formula uses antioxidants, aiming to bolster your furry companion’s immune system. Tasty and healthy fruits and veggies provide vitamins, and complex carbs to ensure energy needed in a regular, activity-packed day. Deboned chicken and whitefish selected for this formula make a substantial source of quality protein. It helps your pup to grow and have a strong, muscular body. Fibers which are present in abundant levels support efficient digestion. This is why this formula makes good assistance in cases of canine obesity. Chondroitin Sulphate maintains the mobility of joints in pups. The extract of Yucca Schidigera contained in this blend has a positive effect in reducing the stool odor. If your canine suffers from allergies or has a hard time digesting most dog food formulas, Purina Pro Plan Focus may prove to be a perfect choice. Its protein comes from salmon as the first ingredient. In combination with rice and oatmeal as providers of carbs, it creates a blend perfect for stomach sensitivities. Its probiotic formula facilitates digestion and reduces the occurrence of intolerances and allergies. Salmon is an ingredient extremely rich in quality protein. It keeps the body strong and creates lean muscles. Fish oil in this mixture supplies optimal levels of omega 3 fatty acids. Along with omega 6 acids and zinc, it keeps the joints mobile, supports a healthy look of skin and coat. The lack of elements such as soy, corn, wheat, and artificial flavor and color intensifiers, it is ideal for pets sensitive to these ingredients. An ideal food blend for small breeds will cater to the specific nutritional and energy requirements of these canines. Fisky and active, the pups from this group are in need of a higher number of calories per pound. Their fast metabolism calls for higher contents of both protein and fats as well. Small breed dogs grow and reach their maturity at a faster rate compared to their larger relatives. To sustain a proper development, their diet should base on the highest quality ingredients. The source of protein is preferably of animal origin, while the other nutrients come from fruit and veggies. Neither too small nor very large, dogs from this group come in a vast number of shapes. Their levels of daily activity may vary considerably. Some of these pups will feature an extremely high amount of energy and enjoy intense playing sessions, while the others are more on a lazy side. A well-balanced diet in the case of these dogs will revolve around animal protein. Other nutrients include carbohydrates, fats and a complex of elements responsible for the strengthening of the immune system and faster metabolism. All this influences the choice of best food formula for your medium sized companion. An adequate food blend will prevent the incidence of common health issues, such as allergies and obesity, too. To make a responsible owner of a large breed dog, you should pay close attention to the nutrition of your furry friend. The food specially made for these pups should ensure steady growth, provide sufficient amounts of energy and prevent the most common diseases typical of large breeds. High-quality protein makes the core of these breeds’ diet. Additionally, fats, i.e. essential fatty acids, play a significant role as well. Elements such as glucosamine and chondroitin support the development of a strong and functional skeletal system. Calorie density of dog food for large breeds should be controlled to avoid obesity and endocrine disorders. Despite their robust looks, giant canines are often extremely sensitive. There is a wide range of health conditions that affect these pups and deteriorate their quality of life. The role of properly selected food is of utmost importance. The right food formula will promote a moderate, steady growth of these puppies. An uncontrolled, food-fueled increase of size typically does an enormous amount of harm in these dogs. Protein obtained from lean meat, limited levels of carbs, quality fats are what makes an adequate combination of nutrients. Finally, strictly controlled content of minerals such as calcium and phosphorus should minimize the likelihood of orthopedic disorders. Quality wet foods include ingredients of great nutritive value. Their main feature is the high amount of water which ensures proper hydration of your canine, too. Due to the high contents of liquid, servings of canned food are of a greater volume for the same amount of nutrients. Your pup will, as a result, get full more quickly. These savory and palatable blends can be successfully combined with dry kibble, or used simply as treats. These foods are prone to contamination, so they should not stay out of a can for longer than an hour or two. Read more: How to Choose Best Canned Dog Food? Dry commercial foods present a convenient feeding option for your pup. You should follow a couple of rules when offering dry kibble to your furry buddy. You can determine a suitable amount per meal based on both the manufacturer’s instructions, as well as on your vet’s expert advice. Serving these types of food depends on factors such as age and types of needs. Typically, growing pups are fed three to four times a day, whereas adult dogs normally eat two meals. Some owners make the food available through a whole day. It is important to provide plenty of fresh water at all times to dogs on this type of diet. Read more: What’s the Best Dry Dog Food? As a result of high activity levels and constant growth, puppies call for sound nutrition rich in calories. Protein, quality fats, and carbs make the grounds for a sound diet. Amino and omega fatty acids are of vital significance in puppy food blends. More daily meals (usually 3 to 4) is another characteristic of baby-dogs’ diet. It is not advisable to feed adult dog formulas to growing pups, because of lower calorie values. It can result in certain nutritive deficiencies. Excessive intake of food at an early stage of development leads to obesity, excessive growth or alarming problems with the skeletal system. Nutritive requirements of grown-up canines follow from their shape, daily activity, and health condition. Quality commercial formulas combine the finest ingredients to meet all of these needs. Two daily meals enable constant and steady absorption of nutrients. Adult dogs require significant levels of protein, which is the main component of these blends. To provide energy without leading to packing on extra pounds, levels of fats and carbohydrates are limited to recommended amounts. Mature dogs’ body defense systems are enhanced owing to vitamins and minerals contained in fruit and vegetable ingredients. Antioxidants contribute to the elimination of harmful toxins from the body. Although not necessarily, certain health conditions typical of golden age may call for some changes in the regular feeding routine. Senior dog foods are most commonly richer in protein, as these dogs tend to lose their muscle mass. Sometimes they are more abundant in fats, too. These should be chosen with caution, as they may lead to obesity. Fatty acids are extremely useful in supporting the joints. Higher contents of fiber help your senior friend digest its food with greater ease. Smoother texture and appropriate kibble size will make a great difference in case of most common dental issues in elderly pups. The highest priority of such a diet is to regulate the levels of sugar (glucose) in your canine’s blood. This is why the food for such dogs needs to be rich in protein and fiber, but low on fats and limited in terms of carbs. It should prevent obesity and related eye or kidney disorders. Lactating females’ diet is not substantially different from the regular high-quality pre-pregnancy nutrition. Due to slightly increased energy needs, it should be a bit more abundant in fats, calcium, and protein. Its calorie value ought to be higher, too. This will sustain lactation and ensure suitable levels of nutrients for both the mom and its puppies. Hypoallergenic diet has the greatest impact on the prevention of allergies. Components like chicken and rice normally present a safe choice. Such food blends have to eliminate all the common allergy triggers such as soy, corn, heat, dairy, eggs, gluten. There should be no traces of artificial colors and flavors, preservatives and taste intensifiers either. No matter how desperate you might be because of your finicky eater, it is important to remember that treats, table scraps, and human food are not the best choice. Well-balanced dog food formulas will cater to your picky friends’ needs. It just might be more demanding to find the one they will find most palatable and appetizing. Causes of diarrhea in canines are varied, but proper diet contributes to overcoming of this issue. After a fasting time, you should gradually reintroduce food consisting of white meat and easily digestible carbs, usually obtained from rice. Try to keep it simple, without too many flavors or ingredients which might worsen the existing condition. Read more: How to Feed a Dog with Diarrhea? Pups with gentle tummies will benefit from those food blends containing easily digestible ingredients. These usually include chicken, turkey or beef. Probiotics and prebiotics present in such foods maintain the digestive system health. Artificial colors, preservatives, and allergens do not enter the list of ingredients. There is a direct link between your dog’s diet and the amount of waste they produce. If you find it excessive, it is possible to have some control over. High-quality foods based on protein and highly digestible ingredients, without mere filler ingredients, will result in a smaller volume of waste. The amount of gasses in your pooch’s digestive system sometimes increases above the normal level. Unless there is a more serious health condition, a diet for such dogs should exclude the ingredients which are responsible for excessive gasses. These include beans, peas, soy, corn and starch, broccoli, cauliflower, and dairy products. To prevent or deal with loose stool in your pup, choose an easily-digestible diet which rules out most common causes of allergies and food intolerances. Some of them are soy, wheat, corn, gluten, dairy, and eggs. Moreover, it should never contain artificial color and flavor intensifiers, preservatives or fillers. Finding the cause of colitis in your pup is of equal importance as the treatment itself. Once you identify the ingredient or a group of the triggers, simply eliminate them from your furry friend’s diet. Wheat is often responsible for the occurrence of this condition. Artificial chemicals are also known for having this negative feature. This condition can cause a lot of discomfort to your pup. The role of diet can be vital in dealing with it. Owners should pick a highly-digestible, grain-free formula. It should also exclude additives which intensify the flavor and color, plus the chemical preservatives. Keep your puppy’s food choice simple and plain. Many dogs suffer from this unpleasant and usually painful orthopedic issue. The way you feed your pup can bring some relief and make certain symptoms go away. Food formulas containing glucosamine and chondroitin, omega 3 fatty acids, as well as vitamin C are listed as the best options in these cases. Inflamed, painful and worn-out joints can give your furry buddy a lot of a hard time. In order to improve the existing situation, select your canine’s nutrition carefully. Try offering foods with high contents of vitamin C (to build collagen), fish oil, glucosamine and chondroitin, and adequate levels of copper. Although most common among large and giant breeds, it can actually affect any dog. To prevent this condition, go for food formulas rich in quality protein, fish (salmon) oil, strictly controlled levels of minerals (calcium and phosphorus), and sufficient levels of antioxidants. Glucosamine and chondroitin have also proved to be useful. Shedding is usually the signal of a deficiency of a certain nutrient. Luckily, specially formulated food blends deal with this condition successfully. These are abundant in quality protein and fats. Their contents of carbs are limited. Omega fatty acids in combination with the optimal complex of minerals usually yield positive results. Frustrating both for the pup and the owner, the itchiness of skin usually results from oversensitivity and intolerance to some foods. The safest choice for such canines are the hypoallergenic formulas containing no common allergens (soy, corn, wheat, gluten) as well as taste and color intensifiers, chemical preservatives and fillers. Specialized food blends for this type of health disorder can have a positive impact on your pup’s condition. They contain lower levels of sodium and phosphorus, to reduce the risk of cell damage. They are rich in omega 3 fatty acids, vitamin B, and antioxidants, to strengthen the immune system and reduce inflammation. Depending on the severity of this condition, you should tailor the diet to your pup’s specific needs. Protein-rich formulas with controlled (or moderately restricted) levels of sodium are typically the smartest choice. These will ideally contain optimal levels of omega 3 fatty acids, Magnesium, vitamins B and E, as well as carnitine. Poor dental hygiene, inadequate diet or inefficient digestion are the most common reasons why your pet’s breath smells bad. Specially designed formulas contain kibble which is shaped in a way that helps remove the tartar and plaque from teeth. Easily digestible fibers support efficient digestion, while antioxidants eliminate toxic elements from the intestine. A vast number of fo factors that cause seizures in dogs make it impossible to come up with one ideal formula. However, general guidelines advise those foods richer in protein and fats, but with lower o minimum levels of carbs. Elements such as omega 3 fatty acids obtained from fish oil, vitamins B, E, and D are recommended, too. The seriousness of these conditions calls for greater care when a diet is in question. Consultation with your vet is necessary, but some formulas may bring improvements. These are rich in animal protein and fats, have higher levels of fish oil (source of omega fatty acids) and never contain allergens such as corn, wheat, soy. Proper diet can certainly be of assistance in cases of immune system malfunctioning. It is advised to use food blends rich in natural, meat-based protein, containing ingredients which supply high levels of antioxidants, along with vitamins A, C, D and E. Artificial chemicals and allergens are never present in these blends. The idea that all dogs thrive on the type of diet similar to one they would eat in nature results in raw food formulas. They are manufactured to provide the right balance of necessary nutrients, vitamins, and minerals. Always seek the vet’s opinion if you consider switching to this type of diet. Parents of pups suffering from allergies, food intolerance, and sensitive tummies will keep these formulas on their list of favorites. Grain-free blends help to reduce the risk of occurrence of allergic reactions, digestive or skin problems. They exclude grains, which are the most common triggers of the above symptoms. To manage your pup’s weight effectively, you should do the same with his diet. Certain manufacturers’ blends will support a healthy reduction of weight. These are based on lean meat, limited amounts of fats and carbs, but rich in fibers, minerals, and vitamins. These will sustain efficient digestion and metabolic processes. Although less common than excessive weight problems, some dogs will need to pack on a few pounds. Canine food manufacturers offer formulas specially designed to achieve this goal. Considerably richer in protein, they contain healthy fats, carbs, and feature a greater nutritive density. They help to build up a healthy muscle mass. These formulas are useful in dealing with the consequences of excessive weight in canines. Such blends focus on protein as the main component. It usually comes from lean, real meat. The levels of fats and carbohydrates are limited, to achieve a lower value of calorie density. Essential vitamins and minerals are present, though. Read more: How to Choose Best Low Calorie Dog Food? Increased calorie needs in some canines call for foods created for this specific purpose. Such blends provide both higher contents of animal-sourced protein and quality fats. A regular and controlled intake of such foods fuels the energy requirements and helps build up the muscles in your underweight or extremely active pup. At some point in their life, depending on the lifestyle as well, a dog might be in need of extra protein. Particular food formulas meet these requirements successfully, offering considerably higher levels of animal meat protein. These are denser in calories, too. They require closer attention and planning of the canine diet. Moderate levels of sodium in your puppy’s diet are recommendable in dealing with certain health conditions. Such food blends are suited to dogs experiencing kidney deficiencies or problems with the heart. They keep sodium levels lower by eliminating unnecessary additives. Ask your vet for advice before opting for one of these mixtures. Some pups benefit from foods with a limited number of ingredients. The main purpose of these simple formulas is to address specific dietary needs. These include allergies, oversensitivity or intolerance to a certain type of food. Free from any chemicals and artificial additives, such formulas revolve around only a few quality nutrients. Active canines will have a greater need for energy-dense food. Formulas aimed at these pups are rich in protein, sustaining the growth of muscle. At the same time, their levels of carbohydrates are reduced. If not enough protein is included in active dogs’ diet, the loss of muscle mass is likely to occur. In addition to necessary protein, ideal food formulas for hunting dogs include higher contents of fat. This way, a sufficient source of energy will be guaranteed for these active fellows. Some complex carbohydrates in limited amounts might be welcome, too. The best ingredients to look for these are brown rice and sweet potatoes. A food label is the first and most important source of information about any type of canine food formula. Owners, however, often tend to feel lost reading what seems to be an endless list of nutrients, additives, and terms they are not completely familiar with. Learning what to look for is a step towards making the right choice of food for your pup. As the name suggests, the ingredient list will inform you on the types of ingredients that a certain blend combines. You should go for those that have meat as the number one ingredient. Components such as by-products or meals often make owners suspicious about the quality and safety of such products. Study the list carefully looking for potentially harmful components. These might cause allergies in your oversensitive pet. They also may not be suited to a specific health condition. Avoid formulas packed with artificial flavors, colors, preservatives, and fillers. Food labels provide detailed nutritional information in terms of ingredients, their contents, as well as additives. There are certain standards these labels have to adhere to, making it easier for owners to interpret them. Some terms, however, are not clearly defined or standardized and are used freely by manufacturers as a part of product marketing – natural, holistic, etc. 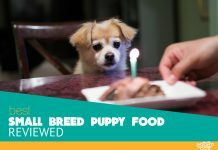 By analyzing the information on various types of food, owners can opt for the one that seems to be the closest to what their puppy actually needs. It is important to note that nutrition requirements depend on several factors. Owners have to be well aware of all of them, in order to make the wisest choice. Life stage, the extent to your canine is active on a daily basis, the breed and potential special needs all play a role in making the best assessment of a particular formula. Consultation with your vet can be of key significance, too. All responsible pet parents are likely to agree on one thing. You cannot take your pup’s nutrition for granted and expect your furry buddy to thrive. It may take quite some time, energy, patience and money to find the type of diet that will help your dog reach its full potential. By offering specially designed, high-quality blends to their pups, owners can feel confident about providing their pets with nothing but the best. One thing is certain. Sound nutrition based on quality ingredients will make your greatest ally in helping your pet live an active, joyful and long life.